Problem and happiness is something contradictory. Problem is something we hope never comes. Happiness is something we wish always there around us. We man often think and dream that the world without problem is perfect. But man themselves are the creators of the problems. Problem may come from around us such as environments, family, friends. But most of the problem come from ourselves. It comes from our thinking. How we react comes from our thinking. The most important thing to do when we must deal with our problem is to change our thinking. Try to think several angle of perspective. It may help create the answer. Use our common sense to analyze and detect the source of the problem. Next, don't let problems ruin our entire life. 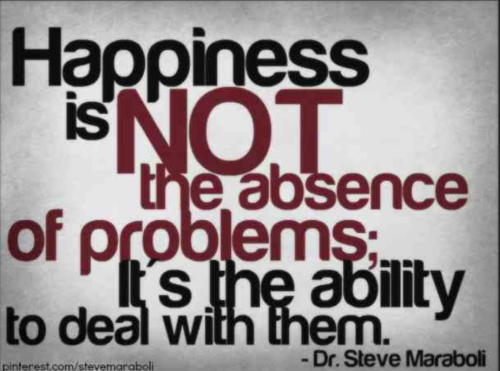 Don't let problems steal our happiness and prevent us from remain happy in facing the problem. We may not have the perfect life, but it doesn't mean that perfect is everything. My life is far from perfect, but I'm happy with what I have and working hard to get to where I want to be.